Oatmeal pumpkin muffins with sunflower seeds. These oatmeal pumpkin muffins would make a great breakfast or snack for Thanksgiving, Halloween or any fall morning. 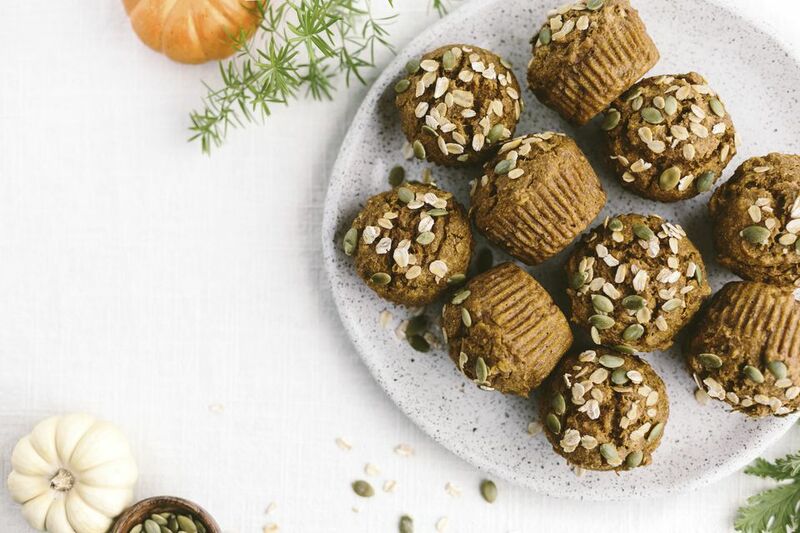 Adding sunflower seeds means there's a bit of protein in these muffins too, making them perfect for vegetarians. Try them with soy milk and an egg replacer for a reduced-fat and vegan version. Oatmeal and pumpkin muffins recipe and photo courtesy of the Wheat Foods Council. Pre-heat oven to 425 degrees. Prepare a muffin pan for 12 muffins. Combine flour, sugar, baking powder, pumpkin pie spice and soda. Mix well. In a separate bowl, combine pumpkin, egg, milk and oil; add to dry ingredients and stir only until ingredients are combined. Stir in oats and sunflower seeds. Fill muffin cups 3/4 full with batter. You can top these pumpkin muffins with an optional sweet topping. To prepare the topping, combine the topping ingredients (1 tbsp margarine, 1/3 cup brown sugar, 3 tbsp sunflower seeds, 1 tbsp flour and 1/4 tsp pumpkin pie spice) until crumbly. Sprinkle over the muffins before baking.